When I was a boy of 5- or 6-years old, my grandmother took me to the R. H. Macy’s Department Store on 34thStreet, Manhattan, during the Christmas Holiday season. We boarded a train from Brooklyn that took us there. It was a double gift from her as we were out together to share a major attraction, the store and shopping experience, and for Christmas presents. HOORAY! While my memory is admittedly a bit vague as this was probably 65-years ago, I can remember being awed by the whole experience. There were the incredible window displays. Each window a fully animated scene of Christmas celebration. There was Santa in his sleigh, elves assembling toys in their workshop at the North Pole, children hanging stockings over the fireplace and many more. The displays lit-up the sidewalk and the faces of all of us who took in the sights. Then there was the interior of the store with the crush and excitement of the crowds. While I held tight to my grandmother’s hand as she led me to Santa’s locale, I ricocheted off people like a ball in a pinball machine. 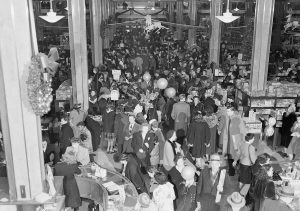 My eyes were bright and wide as I took in the Christmas trees, lights, ornaments and special displays that were lavishly spread throughout the store, floor by floor. Each floor and department was chock-full of merchandise, the kind that creates a deep hunger that can only be satisfied with purchases. The only department of interest to me, as I imagine it was for all children then and today, was the toy department. There were Lionel train sets, Red-Rider BB rifles, Erector sets (pre-Lego, this was the thing), chemistry and art sets, illustrated books, red fire-engines, bright and shiny bicycles and toys upon toys galore. As children are apt to be, I wanted everything! I had to wait on a long line that I could hardly endure before I was able to see Santa himself. But in the end, it was worth it. Not for the photo op. Instead, I got to earnestly confide to Santa all that I wanted for Christmas. I was rewarded for being a good boy. 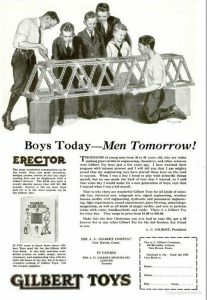 I received the Erector set I so desperately wanted. Today, I have fond memories, albeit faded, of that experience with my grandmother and that grand store. It’s obviously a move to reduce the bleeding and improve the prospect for profit. It’s rationalizing the whole retail product not unlike rationalizing any product. It’s about enabling the retailer to hold-on until a new concept or improved marketing can make a difference in turning the brand around. The question is whether this is really a model for growth or a last-ditch effort to improve solvency. Or, will it merely speed the decline, at the very least, of these stores. When merchandise and services are cut it tends to retard traffic, the very problem Macy’s needs to reverse. The blame for problems is usually placed on new competitors (Amazon! ), the number of competitors, their fierceness, the development of new business models (namely, on-line shopping), among other external factors. But, it really comes down to looking in the mirror and examining those past decisions (or lack thereof) that result in the present situation and scrutinizing current choices and decisions that will unfold the future situation, within the context of the right problems to be solved and opportunities to be exploited. This is the same for our brands as it is for Macy’s. Earlier this year I was in London over a weekend and visited Harrod’s, not once but multiple times. It reminded me of my visit to Macy’s with my grandmother. Harrod’s is a grand attraction. Perhaps, that’s why it was thronged not just with gawkers but plenty of shoppers. I delighted family members with Easter gifts I purchased there as their merchandise and the store itself is so very special. Whatever Macy’s learns from its “test”, it should be sure it is addressing the right problem. And, if the brand is to grow it will very much need, in the words Jack Trout, to “Differentiate or Die”, not shrink its way to greatness.